Today's post is about one of Brisbane's oldest parks, Yeronga Memorial Park on Ipswich Rd, Yeronga. In fact, its importance probably goes back centuries, as it was used by various tribes of the Jagera indigenous people well before white men set foot on Australian soil. Yeronga is an eclectic suburb that contains some of Brisbane's most prestigious addresses as well as more humble abodes. Crown land was first sold at Yeronga in 1854, and the area then was principally used for farming purposes. As the important grazing areas of the Darling Downs were opened up, the Brisbane to Ipswich road was established. Yeronga Park today is bound by Ipswich Rd on one side. Yeronga Park was proclaimed a recreational reserve in 1882, and after the railway line to Ipswich commenced in 1884, land in the area was subdivided for housing. 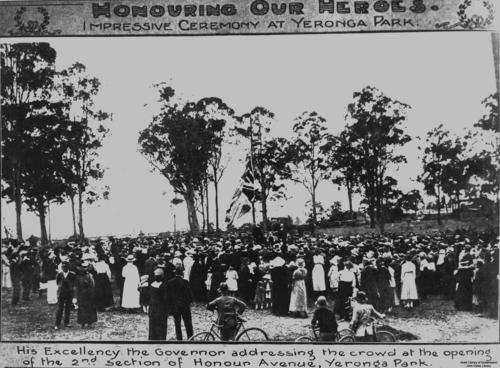 Yeronga Park's recreational use was augmented in 1909 with a tennis club and 1912 with a bowls club. WWI had a severe impact on this district, along with many others. In March 1917 there was a ceremonial planting of trees along Honour Avenue, which runs through the park, commemorating those from the area who had paid the supreme sacrifice. At least 15% of the men from this area who enlisted for WWI perished overseas and their bodies were never brought back to Australia. A tree was to be planted in memory of each digger who did not return. This is the first planting, in September 1917, with Lt-Col Ferguson speaking to a group of relatives. 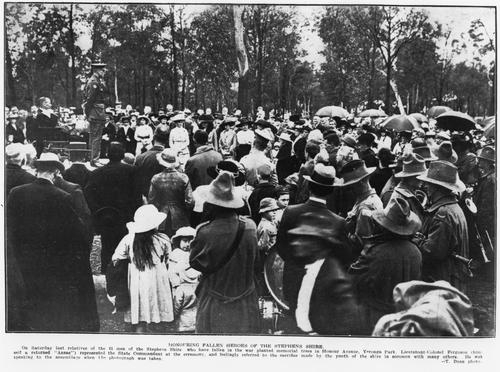 A second planting took place in July 1918 with the governor in attendance. A third and final planting occurred in August 1919, and then in 1921 a further memorial was erected in the park in the shape of a cenotaph containing marble tablets with the name of each of the soldiers who had been killed inscribed in alphabetical order. There was later controversy over the memorial tablets though - the relatives of an original Anzac who returned to Australia incapacitated and subsequently died of his war-related disability sought to have his name added to the memorial.This was denied by the local authority, the Stephens Shire Council, as he did not die overseas during the war. There was significant community reaction to this, especially when it was pointed out that the names of shire council office-bearers, as well as the builder and the architect of the cenotaph (none of whom had died overseas!) were included on the honour roll. In the end a terse comment from the governor, who opined that the councillors' services were not comparable to those who fought, prompted the removal of those names and the inclusion of the dead serviceman on the honour roll. This is the cenotaph today. Also in 1921, memorial gated were constructed at each end of Honour Avenue. Here is a photograph of the gates at the Ipswich Rd end. During WWII, the park was home to a number of US forces. the photo below shows Camp Yeronga at that time. Since the end of WWII, the park has again returned to its recreational importance. Facilities for croquet, blind cricketers and the in-ground draughts board, all created decades earlier, were put back into use. Later the Yeronga Park Memorial Swimming Complex was developed in the south-west corner, and in 1970 Souths Rugby Club leased an area that is still their home ground today. I walked through this park so many times on the way to or from School in Villa Street... rushing to get the tram in the afternoon... great memories. Thanks for the info - you are correct. The paragraph has been reworked accordingly.